To Oversee or Not to Oversee? A certificate of public advantage (COPA) is a tool used by states to permit and oversee hospital mergers that create monopoly powers. A few months ago, we published a paper about the use of a COPA in Tennessee and Virginia. But what happens when a COPA is repealed? In a new issue brief, Erin Fuse Brown, of Georgia State University College of Law, takes a look at the COPA law in North Carolina that was enacted in 1993 and repealed in 2015. 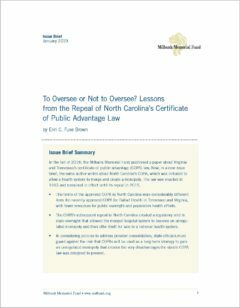 The paper describes the circumstances of the establishment of the COPA in North Carolina and how its repeal created a regulatory void in state oversight that allowed the merged hospital system, Mission Health, to become an unregulated monopoly. It also compares the terms of the North Carolina COPA with those of the Tennessee and Virginia COPA, noting that North Carolina’s provided fewer resources for public oversight and population health efforts than Tennessee/Virginia’s. The issue brief provides a cautionary tale for other states considering COPAs to avoid the potential adverse effects of health care consolidation. In considering policies to address provider consolidation, state officials must guard against the risk that COPAs could be used as a long-term strategy to gain an unregulated monopoly that creates the very disadvantages the state’s COPA law was designed to prevent.